Today we’re going to look at peer-to-peer lending, and in anticipation of its inclusion in the ISA regime, at putting together a portfolio of loans. Since the financial crisis (that is to say, for the past seven years), savers have had to suffer financial repression (base rates below inflation) whilst borrowers have found credit difficult to come by and expensive. These are ideal conditions for peer-to-peer (P2P) lending to thrive. Low interest rates mean savers will try new things, including lending money to strangers on the internet. Fans see P2P lending as part of the new “sharing economy”. Like Uber and Airbnb, they provide a commodity they do not own themselves – money. The “new”1 platforms have healthy balance sheets and no high-street branch costs. Whilst they are too young to have built a reputation for stability and safety, they do not suffer the negative reputations of most high street banks. They directly match borrowers and lenders – usually via online auctions – and take a cut of the interest on the loan. Some platforms let lenders choose where to invest, others spread the risk of default by dividing investments across many loans. They pay much more interest than banks (typically around 5%) and can still undercut their loan rates. So it’s no surprise that P2P lending is growing fast – in the UK volumes double every six months, and have passed £1bn (still tiny against the £1.2trn in bank deposits). Having started in unsecured consumer credit, competing against personal loans and credit cards, P2P has expanded into lending to small businesses, student loans and even mortgages. Public awareness is still low however – PWC found that only 15% of Britons had heard of the main players Zopa, Funding Circle and RateSetter (98% knew of the main high street banks). P2P also removes the dangerous mismatch in normal banking between short-term deposits and long-term loans, by locking lenders in for the loan’s duration. This lock-in means that a secondary market is developing. Lenders can get their money back by selling the loan at a discount. Sometimes it is bought directly by the platform, sometimes there is an auction to other lenders. Regulators have generally used a light touch with P2P because the default risks are borne by those who put in the money, not by the general public. 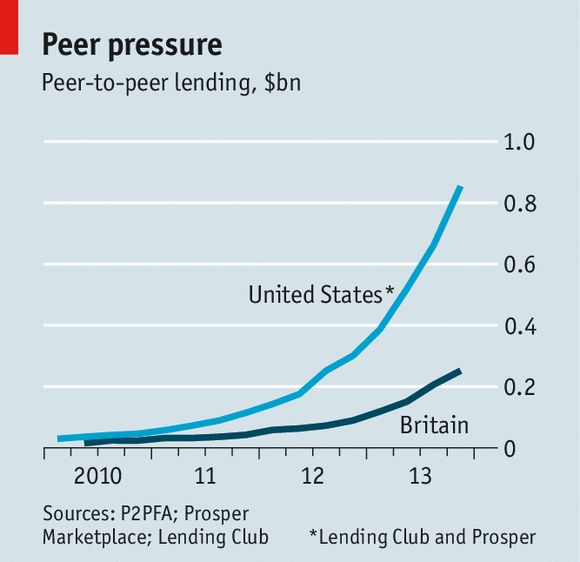 But the industry is maturing – P2P lending in the UK is now regulated by the FCA. Unlent funds are ring-fenced, and “living wills” (arrangements for third parties to take over loan books on default) are being put in place. The true test will come when a platform goes bust. One drawback is that loans are not covered by the government insurance scheme that covers deposits. Some lenders already have internal “provision funds” to set against bad loans, but with no guarantees. Institutional investors are now trying to get in on the act. Only a third of the money coming to Lending Club in the US is now from retail investors: the rest (and the fastest-growing part) comes from rich individuals and from institutions (including hedge funds). In America many firms have replaced the P2P label with “marketplace lender”. This is not a problem in itself, as it raises liquidity. The key issue is neutrality – large investor should not be able to pick the best (safest / highest earning) loans on offer, and nor should they get better rates in general. See also: Who's Afraid of Bitcoin? Zopa has come out in favour of all savers being treated equally, but many industry observers fear that big lenders will eventually dominate. In which case the P2P platforms would be hard to distinguish from banks. P2P lending firms benefit from the declining cost of information-gathering in general and credit scoring in particular. This parallels the development of the bond market from the 1980s, when only a few hundred blue-chip firms could issue bonds. Within ten years all creditworthy firms could do this, and a decade later “junk”-rated firms could do it too. Things like using a credit card to withdraw cash, or making minimum monthly repayments can be revealing. Zopa tracks people it turns down to see if they repay the loan they took from another lender. Social-media activity is only used in the UK to confirm identity. In Germany, Kreditech uses not only Facebook, but behavioural data like the way its online application form is filled in. Using capital letters and mouse speed are apparently useful. And credit-scoring doesn’t only look to the past. SoFi in SanFransico offers credit to HENRYs (high income, not rich yet). It refinances student loans high-potential graduates, and also offers mortgages. “Our credit assessment looks to the present and the future, not just the past,” says boss Mike Cagney. The reverse is also true – deadbeats will be named and shamed. Many observers worry how P2P platforms will cope in a downturn. When loans default, a bank is in trouble – it can’t pass its loans to its depositors. A taxpayer-funded bail-out is always on the cards. P2P lenders explicitly accept that they may suffer losses. And P2P platforms can’t suffer a bank run – their lenders only get repaid at the end of the loan term. All platforms boast that they have “prime” borrowers, but under pressure to show rapid growth in their loan book, the temptation is to relax the rules. Low default rates may appear to show that this hasn’t happened, but rapid growth means this is misleading – 10% of defaults looks like 5% if the loan book has doubled. And the separation of the credit-scoring from the person who will suffer from default does echo the sub-prime crisis, where borrowers were given mortgages by brokers who did not suffer if they weren’t repaid. The P2P chain is much shorter than with sub-prime. The platform will be implicated in any defaults, making it much harder to attract new lenders. Another worrying feature is that many borrowers are return customers, using P2P to refinance an earlier P2P loan. Any contraction in the industry would probably push these people to default. This increased default rate would put new lenders off that platform, potentially producing more defaults. This is a good reason to limit institutional involvement, since retail lenders are less easily scared away. 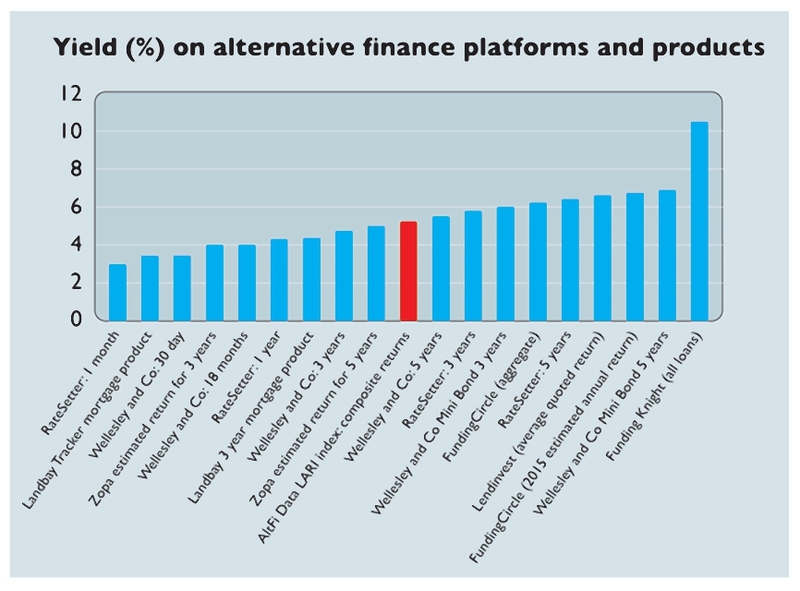 The UK alternative finance scene has seen a lot of new competitors over the past year. As a result, the spread of rates and the range of lock-up periods has also increased, from 2.9% over one year ar Ratesetter, to more than 10% on new platforms lending to small businesses. The red column is the AltFi Data LARI index – a blended return for Zopa, RateSetter and Funding Circle, which currently sits at 5.15%. He calculates that with investment seven platforms (split 3:2:2) the yield would be almost 6%. He plans to actually build this portfolio and report regularly on its performance. I was an early adopter of Zopa, but I haven’t been an active lender for years, as I keep waiting for the ISA option to appear. At the moment, the investment trusts are as far as I would go. I will revisit the situation when P2P becomes eligible for ISAs and SIPPs. My fear is that the ISA and SIPP platforms will add their own P2P lending rather than partner with one or more of the existing big three, making a directly invested diversified portfolio hard to construct within a tax wrapper. Interesting post thanks. I’ve never thought about building a P2P portfolio as such. Although I have invested in three different platforms, I’m not adding any new funds in right now, just reinvesting the interest and repayments. A few platforms you’ve mentioned that I’d not heard of but which I’ll now check out, cheers. Can I invite you to also try rebuildingsociety.com – it is one of the smaller, upcoming P2P lending platforms, certainly worth keeping track of. Previous story Bitcoin and the blockchain – time to invest? 7 Circles > Passive & Assets > Assets > Peer-to-peer lending – time to build a portfolio?